Patients with liver failure could be helped by an machine that uses human liver cells to remove poisons from the blood. Approximately 5,000 people die from liver failure each year in England and Wales. Only just over 500 liver transplants are carried out. However, while kidney failure patients can go on dialysis while they wait for a transplant, options for liver patients are more limited. Mechanical filters exist which can remove some of the toxins from the blood, but scientists are looking for more effective methods. Other "liver assist systems" have been developed which involve filtering the blood plasma through pig liver cells. However, this raises fears about unknown diseases from pigs finding their way back into humans. The ELAD system developed in the US is the first to use liver cells from humans to perform the same task. Patients are attached to the machine by a catheter into a neck vein, and the blood is initially put through a mechanical filtration process to remove some waste products. 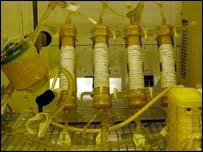 Then the blood plasma is passed through cartridges containing the hepatic cells before being returned to the body. Dr Roshan Shresta, who is organising a trial of the system at the University of North Caroline at Chapel Hill, said: "Currently, we don't have very good therapies for patients with acute liver failure. "That's why we're hoping that the new technology will make a big difference. He added: "A remarkable feature of the liver is its capacity to regenerate. "If we can sustain acute liver failure patients early on, right from the beginning, they may not need transplantation and may recover." A small-scale study of just 16 patients given the treatment found that the condition of 13 of them improved. Nigel Hughes, the chief executive of the British Liver Trust, said that the arrival of a device using human cells would be a "major step forward". He said: "Obviously such treatment would be very expensive, but it could be extremely beneficial." He said that he would have concerns if the human liver cells had been treated to make them "immortal". "Cells like these would share many qualities with cancer cells, and it would be important to make sure none of them got into the patient."